Spinning Song, by Alert Elmenreich, is a very popular piece of music amongst learning piano players. It is not too difficult to learn and memorize, and it is really fun to play once you have it learned. For many of my piano students, it provides a nice confidence boost and motivator because it sounds and feels like a "legitimate" piano piece (and it is!). You will not feel like a beginner anymore once you have mastered this piece and can play it up to a decent tempo. As a piano student, Spinning Song will add to your developing skills in many ways. It will help you work on your rhythmical vitality and energy, right-hand/left-hand coordination skills, and basic rhythms and chord skills. The melody jumps to the left hand, forcing you to learn how to play the left louder than the right. The sudden dynamic changes are challenging, and the musical-shaping demands you to work on crescendos and decrescendos, as well as natural slowing and restarting. As you master the piece and work to faster tempos, your technique will be pushed to a new level, your fingers moving ever quicker and learning to play with clear articulation. 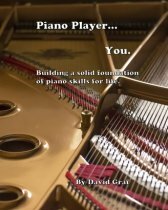 All of these things benefit you as a growing pianist, but this tune also serves as an entertaining and fun way to simply enjoy playing the piano well at a level you know you can handle. From the elementary levels on up to intermediate, it is sometimes hard to find piano pieces that feel and sound satisfying beyond just their learning benefits. But this piece is definitely one of the few that growing pianists can really enjoy playing. To learn this piece, print out the music and then follow along with me on the video. You will work one phrase at a time, right-hand, left-hand, both. You should work as slow as you need to, pausing the video for long periods while you practice each segment. Take slower tempos than I do on the video whenever you need to.